Before we get to the exporting part, make sure you edit your footage on a timeline that supports your footage dimensions. I know this goes without saying, but oftentimes if we whack together a couple of clips, we may not pay attention to what the sequence is set to. When I create a new Premiere project, I tend to skip the opening dialogue that asks me to pick a sequence preset. 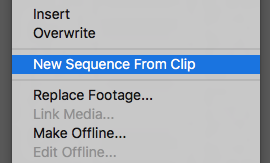 Instead, I import my footage, select the clips I need, then choose “Sequence from Clip” via the right-click menu. After editing your masterpiece, it’s time to export things. Select the timeline, then choose File – Export – Media (or hit CMD+M) to bring up the export dialogue. Typically what I used to do with this dialogue is pick something that was close to the settings I wanted to export, then tweak it a little if necessary. For 1080p and below, good starting points are H264 under Format, and then a HDTV preset in the various frame rates. But alas, Premiere Pro CS 5.5 came out before there were such things as GoPro Hero cameras that could shoot 2.7k and above, or iPhones that could shoot and display 4k footage. Such presets are obviously absent from the list. But we can create our own – if we know which parameters to tweak. 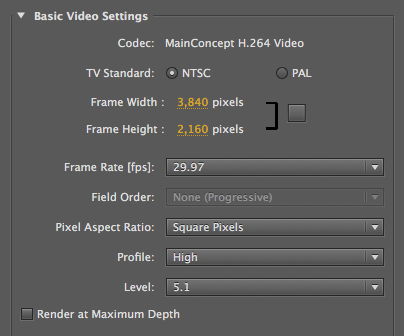 If you’re editing 2.7k footage, the frame width and height are 2704 and 1520 respectively. The last two parameters (Profile and Level) are responsible for giving the initial error message by the way. Feel free to increase the data rate and encoding settings to your liking. When you’re done, save your preset at the top. Now Premiere will happily export higher resolution footage like a Pro. Great article which has helped me out enormously. Got my old Premiere 5.5 editing and outputting 4K. Just one minor revision needed. The bullet points for altering frame size need amending as the order in which you do them is wrong. You have to do it in this order or the dreaded “Invalid framesize/framerate for this Level. Please lower the Frame Dimensions, Frame Rate or increase the Profile and Level and try again.” keeps popping up.